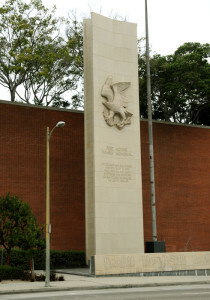 Fort Moore Pioneer Memorial. Photo by Kenneth Mays. Fort Moore was a U. S. military fort in California during the Mexican-American War. 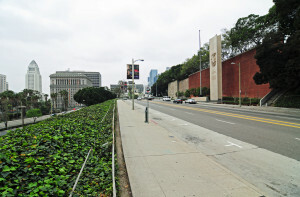 It was located in what is now downtown Los Angeles. Both Mexico and the United States had control of the site at different times. U. S. forces recaptured it from Mexico in January 1847. As part of a further defense strategy, U. S. forces began a 400-foot protective breastwork followed by additional measures. These were built by the Mormon Battalion and the U. S. 1st Dragoons. 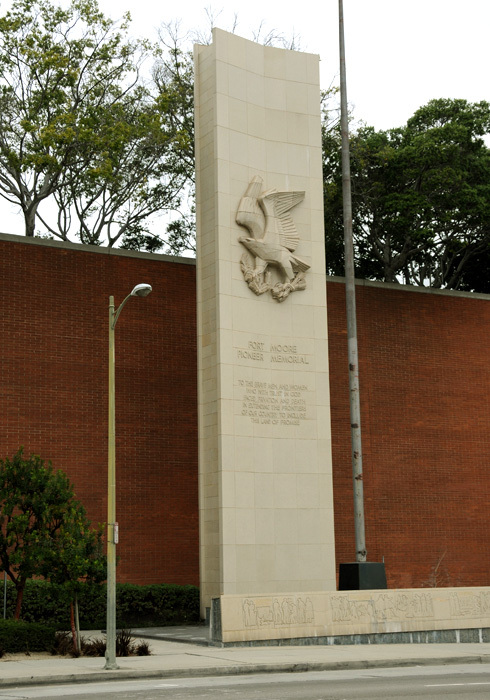 Though never completely finished, the structure was dedicated as Fort Moore on July 4, 1847. 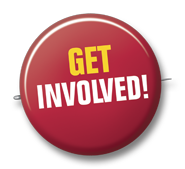 Several months before that, members of the Battalion had been encouraged to reenlist in the Army. Most, however, were determined to find Brigham Young and the Saints headed west to join them. On July 16, 1847, members of the Mormon Battalion assembled by company at Fort Moore. After reviewing the troops, Lt. Andrew J. Smith of the 1st Dragoons said in a low voice, “You are discharged.” The official service of the Mormon Battalion had concluded. Within a period of just a few years, the fort was decommissioned, leveled, and used for various purposes such as a public playground and high school. In 1957 a large stone memorial was built on North Hill Street near its intersection with Cesar Chavez Avenue in Los Angeles. 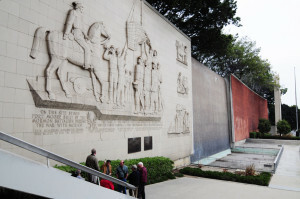 On the wall are featured four different panels which depict various events in the site’s history. Supplied with water from two pools with powerful pumps, a large waterfall once flowed but was turned off during a drought in 1977 and has been dry since then. Panel at Fort Moore depicting the flag raising of July 4, 1847. Photo by Kenneth Mays. The west panel, depicting the historic July 4th dedication and flag raising ceremony, is 45 by 35 feet. 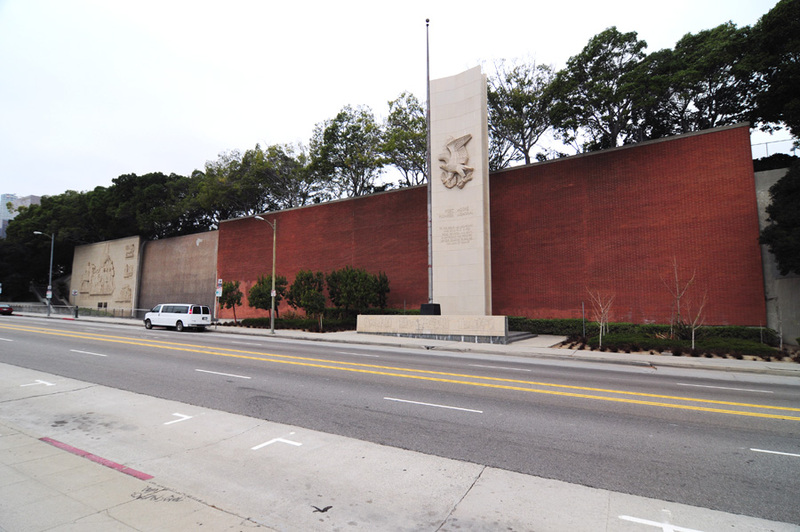 A free standing monument and flagpole stand in front of the monument’s wall at the east end. In recent years, the site has been the scene of July 4th celebrations including flag raisings, cannon firings, food, and historical reenactments. 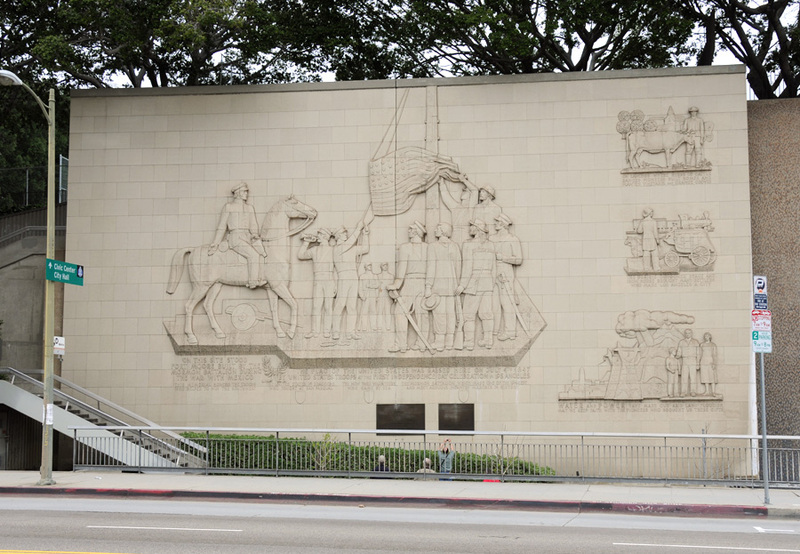 The Fort Moore Pioneer Memorial is located in Los Angeles at 451 North Hill Street in Los Angeles. It is between W. Cesar Chavez Avenue and the 101 Freeway. 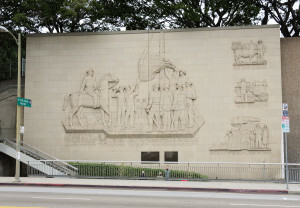 The gps coordinates are: 34°03’29.26 N 118°14’31.54 W.
Fort Moore Pioneer Memorial in downtown Los Angeles. Photo by Kenneth Mays. Sherman L. Fleek, History May Be Searched in Vain, 345-372. Norma Baldwin Ricketts, The Mormon Battalion: U. S. Army of the West, 159. Michael N. Landon and Brandon J. Metcalf, The Remarkable Journey of the Mormon Battalion, 76. David L. Bigler and Will Bagley, Army of Israel, 253-276.